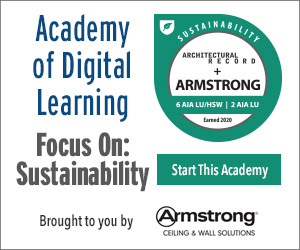 Identify key sustainability criteria (LEED and SITESv2) that can be applicable to outdoor amenity spaces on roofs. Discuss the considerations for evaluating the most appropriate materials for a roof deck project in terms of their structural performance, durability, and meeting LEED and SITES criteria. Explore possible options for achieving higher solar reflective index (SRI) values on roof decks. Understand the various ways of customizing roof deck designs through material selection and roof system design. Real estate studies show that urban housing demands are on the rise. Members of the baby boomer generation looking to retire seek smaller residences that are easier to maintain and desire being in urban areas where they can readily access public transit, quality medical care, and other lifestyle preferences. Members of the millennial generation want the convenience of living and working in urban areas that offers a wealth of amenities and a variety of transportation or walkable options. As the demand for urban housing increases, developers are expected to provide more and better amenities that add value to housing properties and entice potential renters and urban home/condo buyers. Photo courtesy of Daniel Weinbach & Partners Ltd. This aerial view shows the eighth-floor amenity deck and gardens at Hubbard Place, Chicago. Roof decks and terraces are now a must-have amenity space in urban environments and are easily added without increasing the building footprint by building out underutilized roof space. Roof decks provide outdoor spaces that are easily accessible to residents and can be designed to accommodate social and recreational needs. New outdoor roofs incorporate a wide variety of site amenities, including patios, dining and bar areas, putting greens, pools, garden spaces, and grilling areas. Business owners are also looking for office spaces that offer amenities, as they help to increase usable office space, contribute to employee well-being by providing the opportunity for employees to get outside and walk or stretch, and reinforce the corporate brand identity of the integration of work and life, such as with large tech companies, all while creating a professional, creative, and collaborative environment conducive to better business. Commercial building owners now understand the importance of shared amenities as an attraction for high-quality office tenants, improving their tenant retention and increasing the overall building value. There are a variety of products and materials that are utilized in the design and construction of roof gardens and decks. This course will review the basic types of roof systems as well as the range of hardscaping products that are available to designers. The actual roof deck surface can be comprised of both hardscape materials and green planting areas. Roof deck areas can benefit the environment and human health and well-being by meeting certain Sustainable SITES and LEED criteria. In large part, they can help to reduce the effects from urban heat through the use of light-colored pavement surfaces and planting areas rather than the traditional roof surfaces of dark gravel and asphalt materials. Conventional ballasted roof systems. These are the earliest types of flat roof systems, and they are still being used. They require flat roofs with slopes of no more than 2 inches height over 12 inches length (1:6). These systems consist of a membrane or a membrane and a substrate material that is loose laid over a deck using ballast to hold the system in place. The ballast is usually a crushed stone meeting ASTM D448 sizing. ASTM D448 stone ranges between 1.5 inches to 2 inches. Lightweight interlocking pavers with integral cementitious coating can also be used as the ballast material. The interlocking pavers provide a smoother walking surface and are more aesthetic than the crushed stone, but in general, these ballast systems are not intended for use other than for servicing of buildings. Extensive roof gardens. These are green roofs that have plants growing in low-profile planting mediums placed over almost the entire roof. Plantings are usually comprised of various types of sedums and hardy wild flowers that are self-sustaining, have shallow root systems, and do not require artificial irrigation. The plants are grown in prepared, shallow soil medium within modular trays that are placed on top of a waterproof roof membrane. Access to and around the roof is provided through small walking paths so these roofs are not designed for extensive foot traffic. They do provide an energy savings as they help to insulate the building. They also reduce the heat effect of traditional dark asphalt or ballasted roof systems. Intensive green roofs. These roofs are similar to extensive green roofs in that they are comprised of both hardscape and plantings. However, soil depths for plantings on intensive green roofs can range from 8 inches up to several feet. The greater soil medium depth allows intensive green roofs to accommodate a wider variety of plant types and species, including large trees. As these buildings and roof systems are usually designed to accommodate more weight, larger hardscape areas can also be included in the design. 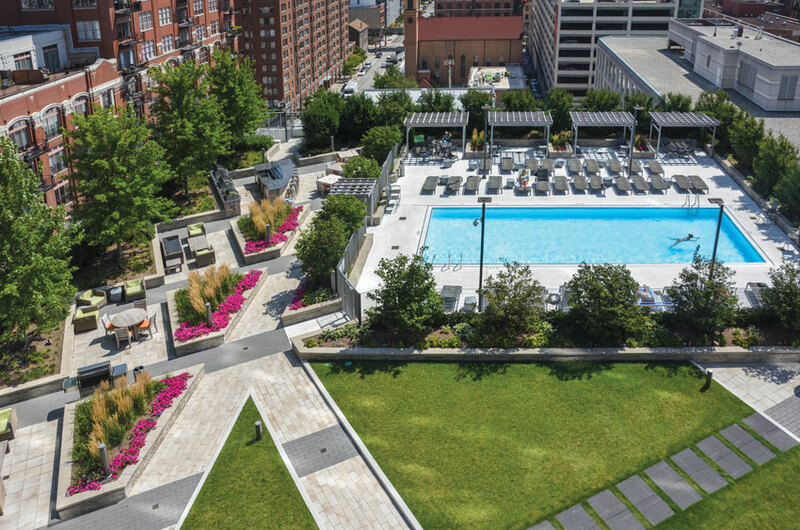 With the combination of larger hardscape surface areas and deeper planting areas, intensive green roofs have the potential to provide more outdoor amenities and additional living space on the roof deck. Pedestal roof systems. These roof systems provide a means of creating a level deck space on top of pitched or uneven roof surfaces that would otherwise not be usable. The pedestal deck systems can also conceal roof extrusions and other obstructions, such as pipes, vents, and anchor points. Pedestal systems allow wood units, stone units, porcelain tiles, natural stone slabs, or concrete slab tiles to be placed on top of a grid of pedestals. For lighter products susceptible to wind uplift, additional fasteners are required to ensure the units stay in place. Shown is a section of a pedestal roof system. The placement of the deck surface on a pedestal system also provides space between the deck walking surface and the roof membrane for added insulation as well as room for utilities, such as irrigation lines leading to planting areas. The preferred layout for this type of system is orthogonal. Curvilinear layouts require significantly more pedestals that can increase the cost. The distance between the pedestals can also be constrained by the size and strength of the slabs or panels that they support. Outdoor amenity roof spaces. The fifth type of roofing system is in high demand, as it provides owners and developers with greater options for providing outdoor amenities in the multifamily and commercial building market. In the past, most outdoor amenity spaces, such as patios, grilling areas, and gardens, for large commercial and residential units were on the ground level. More frequently, these outdoor amenities can now be found on the roof, as developers wish to enhance the marketability of their projects by capitalizing on roof views, while also utilizing roof space that would have previously remained as a mechanical space. Outdoor amenity roof systems need to be more than just open spaces or large expanses of green roofs, as developers are looking for programmed and programmable outdoor amenities that include a wide range of components, such as hardscape patio areas, planting areas, walkways, pet play spaces, fire pits, pools, kitchens, dining and bar spaces, and even putting greens. Real estate market studies have shown that projects offering enhanced outdoor amenity roof spaces may cost more to construct, but they are easier to market, bring in higher rental and sales prices, and retain renters for a longer time frame. The construction of these systems requires careful design and coordination, but developers are seeing potential one-year returns on their investments by including outdoor amenity roof spaces on buildings. The outdoor amenity space provides the best combination of the intensive roof garden, green roof, and hardscape, while still providing water protection for the roof. These are aesthetically pleasing and functional designed spaces. A local landscape architect can provide the most suitable arrangement of the hardscape and planting balance to achieve harmonious connection to the interior building amenities. 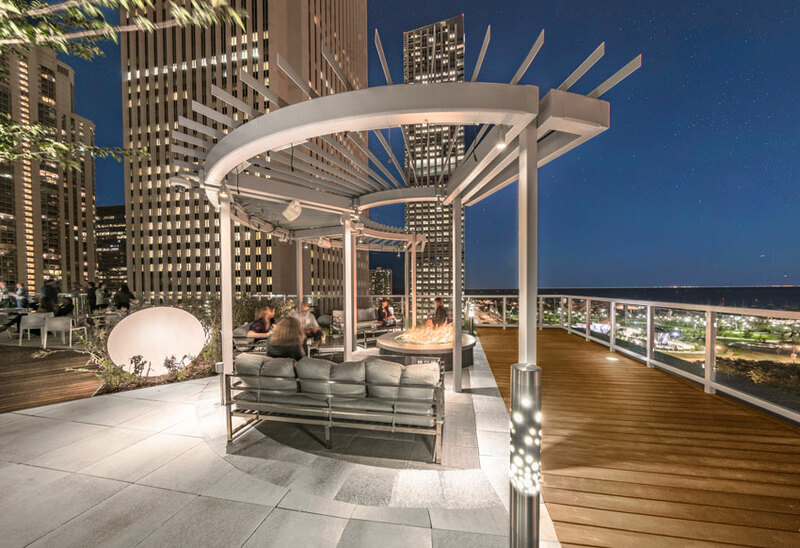 Shown is the outdoor amenity roof space at Prudential Plaza, Chicago.